After our modest celebration for the conclusion of the first field season, project activities continue. We are beginning the lab work. We can’t deny how thrilling the idea of venturing through thousands of artifacts waiting for us is. Who knows how many “treasures” we’ll find among them? Local high-school students are helping us wash the materials. This is extremely necessary for analysis, otherwise we couldn’t observe all the details and features that both lithic and ceramics will show. Currently, apart from the clean-up, we are also digitalizing forms and processing the GPS information in order to produce accurate mound distribution maps. This past week we’ve also met with local authorities and people to tell them about the archaeological research and to thank them for all their support. 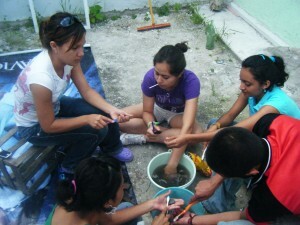 High-school students help us wash the ceramics using tooth brushes, buckets, and water. Fortunately, soils here aren’t acidic, so we can brush sherds without any danger of damaging them. 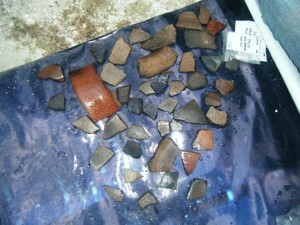 This is how sherds look after being washed. We dried them on a plastic sheet in the sun, taking care not to lose any information (on the labels). Once dried, we bag the sherds until we do the analysis. Analysis will also help us determine El Carrizal’s time depth. 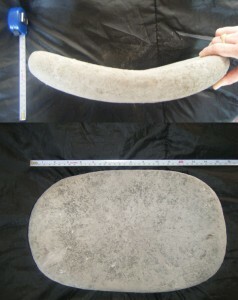 So far, we have preliminary identified materials from the Middle Formative (800 – 400 B.C.) on. Frankly we expect to find earlier artifacts during the lab season. Next week, several Universidad Veracruzana students will visit our camp and we’ll try to show them all the activities that need to be undertaken once fieldwork is done. Additionally, specialists in polished stones and yokes will help us evaluate artifacts we recovered during our survey and were given as donations. This entry was posted on Wednesday, September 9, 2009 at 7:28 am	and is filed under English. You can follow any responses to this entry through the RSS 2.0 feed. Both comments and pings are currently closed. 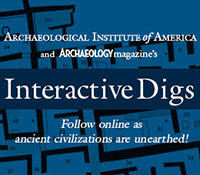 Nice introduction to how archaeologists work. I visited Carrizal once years ago when I taught at the UV. At that time there was quite a bit of discussion regarding whether the yugo Bertha Cuevas found is really Late Formative as she claimed. Do you have anything new to contribute on that?